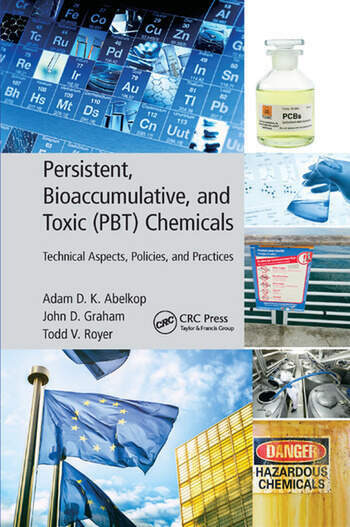 Developed from the efforts of a multiyear, international project examining how persistent, bioaccumulative, and toxic (PBT) chemicals are evaluated and managed, Persistent, Bioaccumulative, and Toxic (PBT) Chemicals: Technical Aspects, Policies, and Practices focuses on improving the processes that govern PBTs. Incorporating science and policy literature—as well as interviews and panel discussions featuring experts from around the world—this book provides you with an international perspective of PBT policies (centering on Europe, Asia, and North America), and reveals major findings and recommendations for improving PBT science, laws, and policies. It includes case studies of specific chemicals, provides an introduction to the overall subject of toxic chemicals, and weighs in on science and policy expansion for PBTs. It also provides summary tables of important PBTs, and discussions on the number of PBTs in commerce, weight of evidence approaches, market deselection, and international management. This book reviews the current science, policies, and practices surrounding the regulation of PBTs. It also provides relevant research, recommendations, and suggestions for improving the management and oversight of PBTs. How many PBTs are in commerce? Adam D.K. Abelkop is an associate instructor at the School of Public and Environmental Affairs and a doctoral candidate in Indiana University’s Joint PhD in Public Policy program administered by School of Public and Environmental Affairs and the Department of Political Science. He earned his law degree from the University of Iowa College of Law and completed his undergraduate studies at Wake Forest University. His research focuses on the ways in which scientific and socioeconomic information are incorporated into judicial decision making, as well as risk regulation for environmental and public health protection. John D. Graham is dean of the School of Public and Environmental Affairs. He earned his undergraduate degree from Wake Forest University, his MA in public policy from Duke University, and his PhD in urban and public affairs from Carnegie-Mellon University. He joined the faculty of the Harvard School of Public Health in 1985 and served as the founding director of the School’s Center for Risk Analysis from 1989 to 2001. Dr. Graham’s research focuses on risk-based decision making. He is the author or coauthor of more than 10 books and more than 200 academic papers. Todd V. Royer is an associate professor in the School of Public and Environmental Affairs at Indiana University. Dr. Royer holds degrees in ecology from Iowa State University and Idaho State University and was a postdoctoral researcher at the University of Illinois at Urbana-Champaign from 2000 to 2003. His research is aimed at understanding how biogeochemical and ecological factors, including human activities, interact to affect water quality and ecosystem functioning in freshwater systems. "… an essential tool for policymakers and practitioners concerned with chemical management policy in the 21st century. It is the best available handbook explaining the history of PBT principles and the current state of regulatory approaches to the subject. It further provides a clear and comprehensive picture of the scientific and policy issues that warrant attention by all parties involved in chemical management matters." "This text provides a comparative analysis of regulatory experience in considering persistence, bioaccumulation and associated toxicity in prioritization and risk assessment of industrial chemicals, based on input from a broad range of sources. As a result, it provides highly relevant and recommended background reading for those considering options to address the essential need to more efficiently prioritize, assess and manage much larger numbers of existing industrial chemicals." "Many countries are increasingly concerned about pollution problems caused by chemicals that are "persistent, bioaccumulative, and toxic" (PBT). Despite international alarm about these chemicals, there is little unanimity about how to regulate or identify them. This book by Abelkop, Graham, and Royer (all, Indiana Univ.) explores the various definitions, methods of analysis, and regulatory policies currently used in the effort to minimize the damage that PBT chemicals may cause. The situation is complicated because different nations analyze and regulate these compounds differently, and there may even be important differences within the subdivisions of individual countries. For example, China, which has become a major chemical producer, has far fewer well-developed policies than the US or the European Union, and some US states have local regulations that differ from national standards. In order to reconcile these various requirements, it will first be necessary to identify how they differ. This book is a valuable step in that direction. It is is well written and thorough but provides a level of detail that will be most useful to advanced-level students and professionals. Thus, it is mainly recommended for libraries that support graduate programs in environmental studies"